Summer fruit pie has been on my mind. So, last week I made three batches of pie crust and froze two. 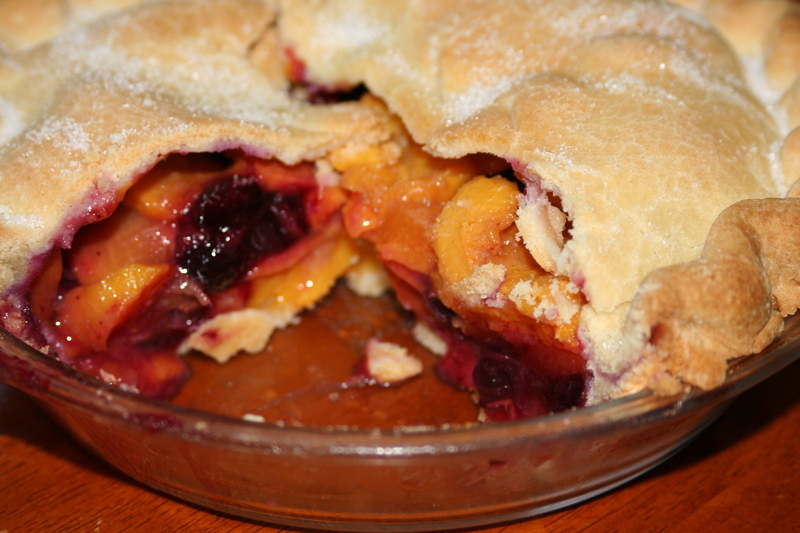 The other one I made into a peach-blueberry pie. Each bite was like a taste of summer! Since it's just Jeremy and I here, a 9-inch pie is a little too much for us. I found a lovely 6-inch Pyrex pie plate at the thrift store and it's become my go-to pie baking pan. One 9-inch pie crust becomes a top and bottom crust for this little pan. When I made this pie, I cut the recipe in half, but aired on the side of a heavy-half. If you want to make the recipe into a peach-blueberry pie, substitute a cup or two of blueberries for some of the peaches. Preheat the oven to 425°F. Roll out half of the dough for the bottom crust and fit it into a 9-inch pie pan. Roll out the remaining dough for the top crust and set it aside on a sheet of waxed paper. In a large bowl, stir together the sugar, flour, cinnamon, nutmeg, and salt with whisk until evenly mixed. Add the lemon juice and peaches and toss until the fruit is completely coated with the sugar mixture. Pile the peaches in the dough-lined pan, mounding them slightly in the center. Scatter the butter over the fruit. Put on the top crust, then trim and flute the edges. With the point of a sharp knife, cut several vents in the top for steam to escape. Bake for 25 minutes, then reduce the heat to 350°F. Bake for another 25-30 minutes, or until the crust is golden brown and you see juices bubbling through the vents. This sounds absolutely fabulous! Blueberry and peach - makes perfect sense, but I have never thought about it. Can't wait to give it a whirl.